"kg" redirects here. For other uses, see KG (disambiguation). The kilogram or kilogramme (symbol: kg) is the base unit of mass in the International System of Units (SI). Until 20 May 2019, it remains defined by a platinum alloy cylinder, the International Prototype Kilogram (informally Le Grand K or IPK), manufactured in 1889, and carefully stored in Saint-Cloud, a suburb of Paris. After 20 May, it will be defined in terms of fundamental physical constants. The kilogram was originally defined as the mass of a litre (cubic decimetre) of water. That was an inconvenient quantity to precisely replicate, so in 1799 a platinum artefact was fashioned to define the kilogram. That artefact, and the later IPK, have been the standard of the unit of mass for the metric system ever since. In spite of best efforts to maintain it, the IPK has diverged from its replicas by approximately 50 micrograms since their manufacture late in the 19th century. This led to efforts to develop measurement technology precise enough to allow replacing the kilogram artifact with a definition based directly on physical phenomena, which is now scheduled to take place in 2019. The new definition is based on invariant constants of nature, in particular the Planck constant, which will change to being defined rather than measured, thereby fixing the value of the kilogram in terms of the second and the metre, and eliminating the need for the IPK. The new definition was approved by the General Conference on Weights and Measures (CGPM) on 16 November 2018. The Planck constant relates a light particle's energy, and hence mass, to its frequency. The new definition only became possible when instruments were devised to measure the Planck constant with sufficient accuracy based on the IPK definition of the kilogram. The gram, 1/1000 of a kilogram, was provisionally defined in 1795 as the mass of one cubic centimetre of water at the melting point of ice. The final kilogram, manufactured as a prototype in 1799 and from which the International Prototype Kilogram (IPK) was derived in 1875, had a mass equal to the mass of 1 dm3 of water under atmospheric pressure and at the temperature of its maximum density, which is approximately 4 °C. The kilogram is the only named SI unit with an SI prefix (kilo) as part of its name. Until the 2019 redefinition of SI base units, it was also the last SI unit that was still directly defined by an artefact rather than a fundamental physical property that could be independently reproduced in different laboratories. Three other base units (cd, A, mol) and 17 derived units (N, Pa, J, W, C, V, F, Ω, S, Wb, T, H, kat, Gy, Sv, lm, lx) in the SI system are defined in relation to the kilogram, and thus its stability is important. The definitions of only eight other named SI units do not depend on the kilogram: those of temperature (K, °C), time and frequency (s, Hz, Bq), length (m), and angle (rad, sr). The IPK is rarely used or handled. Copies of the IPK kept by national metrology laboratories around the world were compared with the IPK in 1889, 1948, and 1989 to provide traceability of measurements of mass anywhere in the world back to the IPK. The International Prototype Kilogram was commissioned by the General Conference on Weights and Measures (CGPM) under the authority of the Metre Convention (1875), and in the custody of the International Bureau of Weights and Measures (BIPM) who hold it on behalf of the CGPM. After the International Prototype Kilogram had been found to vary in mass over time relative to its reproductions, the International Committee for Weights and Measures (CIPM) recommended in 2005 that the kilogram be redefined in terms of a fundamental constant of nature. At its 2011 meeting, the CGPM agreed in principle that the kilogram should be redefined in terms of the Planck constant, h. The decision was originally deferred until 2014; in 2014 it was deferred again until the next meeting. CIPM has proposed revised definitions of the SI base units, for consideration at the 26th CGPM. The formal vote, which took place on 16 November 2018, approved the change, with the new definitions coming into force on 20 May 2019. The accepted redefinition defines the Planck constant as exactly 6966662607015000000♠6.62607015×10−34 kg⋅m2⋅s−1, thereby defining the kilogram in terms of the second and the metre. Since the second and metre are defined completely in terms of physical constants, the kilogram is defined in terms of physical constants only. The avoirdupois (or international) pound, used in both the imperial and US customary systems, is now defined in terms of the kilogram. Other traditional units of weight and mass around the world are now also defined in terms of the kilogram, making the kilogram the primary standard for virtually all units of mass on Earth. The word kilogramme or kilogram is derived from the French kilogramme, which itself was a learned coinage, prefixing the Greek stem of χίλιοι khilioi "a thousand" to gramma, a Late Latin term for "a small weight", itself from Greek γράμμα. The word kilogramme was written into French law in 1795, in the Decree of 18 Germinal, which revised the older system of units introduced by the French National Convention in 1793, where the gravet had been defined as weight (poids) of a cubic centimetre of water, equal to 1/1000 of a grave. In the decree of 1795, the term gramme thus replaced gravet, and kilogramme replaced grave. The French spelling was adopted in Great Britain when the word was used for the first time in English in 1795,  with the spelling kilogram being adopted in the United States. In the United Kingdom both spellings are used, with "kilogram" having become by far the more common. [Note 2] UK law regulating the units to be used when trading by weight or measure does not prevent the use of either spelling. In the 19th century the French word kilo, a shortening of kilogramme, was imported into the English language where it has been used to mean both kilogram and kilometre. While kilo is acceptable in many generalist texts, for example The Economist, its use is typically considered inappropriate in certain applications including scientific, technical and legal writing, where authors should adhere strictly to SI nomenclature. When the United States Congress gave the metric system legal status in 1866, it permitted the use of the word kilo as an alternative to the word kilogram, but in 1990 revoked the status of the word kilo. During the 19th century, the standard system of metric units was the centimetre–gram–second system of units, treating the gram as the fundamental unit of mass and the kilogram simply as a derived unit. In 1901, however, following the discoveries by James Clerk Maxwell to the effect that electric measurements could not be explained in terms of the three fundamental units of length, mass and time, Giovanni Giorgi proposed a new standard system that would include a fourth fundamental unit to measure quantities in electromagnetism. In 1935 this was adopted by the IEC as the Giorgi system, now also known as MKS system, and in 1946 the CIPM approved a proposal to adopt the ampere as the electromagnetic unit of the "MKSA system". :109,110 In 1948 the CGPM commissioned the CIPM "to make recommendations for a single practical system of units of measurement, suitable for adoption by all countries adhering to the Metre Convention". This led to the launch of SI in 1960 and the subsequent publication of the "SI Brochure", which stated that "It is not permissible to use abbreviations for unit symbols or unit names ...". [Note 3] The CGS and MKS systems co-existed during much of the early-to-mid 20th century, but as a result of the decision to adopt the "Giorgi system" as the international system of units in 1960, the kilogram is now the SI base unit for mass, while the definition of the gram is derived from that of the kilogram. The kilogram is a unit of mass, a property corresponding to the common perception of how "heavy" an object is. Mass is an inertial property; that is, it is related to the tendency of an object at rest to remain at rest, or if in motion to remain in motion at a constant velocity, unless acted upon by a force. While the weight of an object is dependent on the strength of the local gravitational field, the mass of an object is independent of gravity, as mass is a measure of the quantity of matter. Accordingly, for astronauts in microgravity, no effort is required to hold objects off the cabin floor; they are "weightless". However, since objects in microgravity still retain their mass and inertia, an astronaut must exert ten times as much force to accelerate a 10‑kilogram object at the same rate as a 1‑kilogram object. Because at any given point on Earth the weight of an object is proportional to its mass, the mass of an object in kilograms is usually measured by comparing its weight to the weight of a standard mass, whose mass is known in kilograms, using a device called a weighing scale. The ratio of the force of gravity on the two objects, measured by the scale, is equal to the ratio of their masses. For more on the history of the kilogram, see grave (unit). On April 7, 1795, the gram was decreed in France to be "the absolute weight of a volume of pure water equal to the cube of the hundredth part of the metre, and at the temperature of melting ice". Since trade and commerce typically involve items significantly more massive than one gram, and since a mass standard made of water would be inconvenient and unstable, the regulation of commerce necessitated the manufacture of a practical realization of the water-based definition of mass. Accordingly, a provisional mass standard was made as a single-piece, metallic artifact one thousand times as massive as the gram—the kilogram. At the same time, work was commissioned to precisely determine the mass of a cubic decimetre (one litre) of water. [Note 4] Although the decreed definition of the kilogram specified water at 0 °C—its highly stable temperature point—the French chemist Louis Lefèvre-Gineau and the Italian naturalist Giovanni Fabbroni after several years of research chose to redefine the standard in 1799 to water's most stable density point: the temperature at which water reaches maximum density, which was measured at the time as 4 °C. [Note 5] They concluded that one cubic decimetre of water at its maximum density was equal to 99.9265% of the target mass of the provisional kilogram standard made four years earlier. [Note 6] That same year, 1799, an all-platinum kilogram prototype was fabricated with the objective that it would equal, as close as was scientifically feasible for the day, the mass of one cubic decimetre of water at 4 °C. The prototype was presented to the Archives of the Republic in June and on December 10, 1799, the prototype was formally ratified as the kilogramme des Archives (Kilogram of the Archives) and the kilogram was defined as being equal to its mass. This standard stood for the next 90 years. "IPK" redirects here. For the plastic material, see IPK Acrylic-polyvinyl chloride. Since 1889 the magnitude of the kilogram has been defined as the mass of an object called the International Prototype of the Kilogram, often referred to in the professional metrology world as the "IPK". The IPK is made of a platinum alloy known as "Pt‑10Ir", which is 90% platinum and 10% iridium (by mass) and is machined into a right-circular cylinder (height = diameter) of about 39 millimetres to minimize its surface area. The addition of 10% iridium improved upon the all-platinum Kilogram of the Archives by greatly increasing hardness while still retaining platinum's many virtues: extreme resistance to oxidation, extremely high density (almost twice as dense as lead and more than 21 times as dense as water), satisfactory electrical and thermal conductivities, and low magnetic susceptibility. The IPK and its six sister copies are stored at the International Bureau of Weights and Measures (known by its French-language initials BIPM) in an environmentally monitored safe in the lower vault located in the basement of the BIPM's Pavillon de Breteuil in Saint-Cloud[Note 7] on the outskirts of Paris (see External images, below, for photographs). Three independently controlled keys are required to open the vault. Official copies of the IPK were made available to other nations to serve as their national standards. These are compared to the IPK roughly every 40 years, thereby providing traceability of local measurements back to the IPK. A replica of the prototype kilogram on display at Cité des Sciences et de l'Industrie, featuring the protective double glass bell. The Metre Convention was signed on May 20, 1875 and further formalized the metric system (a predecessor to the SI), quickly leading to the production of the IPK. The IPK is one of three cylinders made in 1879 by Johnson Matthey, which continues to manufacture nearly all of the national prototypes today. In 1883, the mass of the IPK was found to be indistinguishable from that of the Kilogramme des Archives made eighty-four years prior, and was formally ratified as the kilogram by the 1st CGPM in 1889. Modern measurements of Vienna Standard Mean Ocean Water, which is pure distilled water with an isotopic composition representative of the average of the world's oceans, show that it has a density of 6999999975000000000♠0.999975 ±6994100000000000000♠0.000001 kg/L at its point of maximum density (3.984 °C) under one standard atmosphere (101 325 Pa or 760 torr) of pressure. Thus, a cubic decimetre of water at its point of maximum density is only 25 parts per million less massive than the IPK; that is to say, the 25 milligram difference shows that the scientists over 220 years ago managed to make the mass of the Kilogram of the Archives equal that of a cubic decimetre of water at 4 °C, with a margin of error at most within the mass of a single excess grain of rice. National prototype kilogram K20, one of two prototypes stored at the US National Institute of Standards and Technology in Gaithersburg, Maryland, which serve as primary standards for defining all units of mass and weight in the United States. This is a replica for public display, shown as it is normally stored, under two bell jars. The IPK itself, stored in the BIPM's vault in Saint-Cloud, France. Six sister copies: K1, 7, 8(41),[Note 8] 32, 43 and 47. Stored in the same vault at the BIPM. Ten working copies: eight (9, 31, 42′, 63, 77, 88, 91, and 650[Note 9]) for routine use and two (25 and 73) for special use. Kept in the BIPM's calibration laboratory in Saint-Cloud, France. National prototypes, stored in Argentina (30), Australia (44 and 87), Austria (49), Belgium (28 and 37), Brazil (66), Canada (50 and 74), China (60 and 64; 75 in Hong Kong), Czech Republic (67), Denmark (48), Egypt (58), Finland (23), France (35), Germany (52, 55 and 70), Hungary (16), India (57), Indonesia (46), Israel (71), Italy (5 and 76), Japan (6, 30, 94 and E59), Kazakhstan, Kenya (95), Mexico (21, 90 and 96), Netherlands (53), North Korea (68), Norway (36), Pakistan (93), Poland (51), Portugal (69), Romania (2), Russia (12 and 26), Serbia (11 and 29), Singapore (83), Slovakia (41 and 65), South Africa (56), South Korea (39, 72 and 84), Spain (24 and 3), Sweden (40 and 86), Switzerland (38 and 89), Taiwan (78), Thailand (80), Turkey (54), United Kingdom (18, 81 and 82), and the United States (20, 4, 79, 85 and 92). Some additional copies held by non-national organizations, such as the French Academy of Sciences in Paris (34) and the Istituto di Metrologia G. Colonnetti in Turin (62). By definition, the error in the measured value of the IPK's mass is exactly zero; the mass of the IPK is the kilogram. However, any changes in the IPK's mass over time can be deduced by comparing its mass to that of its official copies stored throughout the world, a rarely undertaken process called "periodic verification". The only three verifications occurred in 1889, 1948, and 1989. For instance, the US owns four 90% platinum / 10% iridium (Pt‑10Ir) kilogram standards, two of which, K4 and K20, are from the original batch of 40 replicas delivered in 1884. [Note 10] The K20 prototype was designated as the primary national standard of mass for the US. Both of these, as well as those from other nations, are periodically returned to the BIPM for verification. Great care is exercised when transporting prototypes. In 1984, the K4 and K20 prototypes were hand-carried in the passenger section of separate commercial airliners. Note that none of the replicas has a mass precisely equal to that of the IPK; their masses are calibrated and documented as offset values. For instance, K20, the US's primary standard, originally had an official mass of 1 kg − 39 μg (micrograms) in 1889; that is to say, K20 was 39 μg less than the IPK. A verification performed in 1948 showed a mass of 1 kg − 19 μg. The latest verification performed in 1989 shows a mass precisely identical to its original 1889 value. Quite unlike transient variations such as this, the US's check standard, K4, has persistently declined in mass relative to the IPK—and for an identifiable reason: check standards are used much more often than primary standards and are prone to scratches and other wear. K4 was originally delivered with an official mass of 1 kg − 75 μg in 1889, but as of 1989 was officially calibrated at 1 kg − 106 μg and ten years later was 1 kg − 116 μg. Over a period of 110 years, K4 lost 41 μg relative to the IPK. Mass drift over time of national prototypes K21–K40, plus two of the IPK's sister copies: K32 and K8(41). [Note 8] All mass changes are relative to the IPK. The initial 1889 starting-value offsets relative to the IPK have been nulled. The above are all relative measurements; no historical mass-measurement data is available to determine which of the prototypes has been most stable relative to an invariant of nature. There is the distinct possibility that all the prototypes gained mass over 100 years and that K21, K35, K40, and the IPK simply gained less than the others. Beyond the simple wear that check standards can experience, the mass of even the carefully stored national prototypes can drift relative to the IPK for a variety of reasons, some known and some unknown. Since the IPK and its replicas are stored in air (albeit under two or more nested bell jars), they gain mass through adsorption of atmospheric contamination onto their surfaces. Accordingly, they are cleaned in a process the BIPM developed between 1939 and 1946 known as "the BIPM cleaning method" that comprises firmly rubbing with a chamois soaked in equal parts ether and ethanol, followed by steam cleaning with bi-distilled water, and allowing the prototypes to settle for 7–10 days before verification. Before the BIPM's published report in 1994 detailing the relative change in mass of the prototypes, different standard bodies used different techniques to clean their prototypes. The NIST's practice before then was to soak and rinse its two prototypes first in benzene, then in ethanol, and to then clean them with a jet of bi-distilled water steam. Cleaning the prototypes removes between 5 and 60 μg of contamination depending largely on the time elapsed since the last cleaning. Further, a second cleaning can remove up to 10 μg more. After cleaning—even when they are stored under their bell jars—the IPK and its replicas immediately begin gaining mass again. The BIPM even developed a model of this gain and concluded that it averaged 1.11 μg per month for the first 3 months after cleaning and then decreased to an average of about 1 μg per year thereafter. Since check standards like K4 are not cleaned for routine calibrations of other mass standards—a precaution to minimize the potential for wear and handling damage—the BIPM's model of time-dependent mass gain has been used as an "after cleaning" correction factor. What is known specifically about the IPK is that it exhibits a short-term instability of about 30 μg over a period of about a month in its after-cleaned mass. The precise reason for this short-term instability is not understood but is thought to entail surface effects: microscopic differences between the prototypes' polished surfaces, possibly aggravated by hydrogen absorption due to catalysis of the volatile organic compounds that slowly deposit onto the prototypes as well as the hydrocarbon-based solvents used to clean them. It has been possible to rule out many explanations of the observed divergences in the masses of the world's prototypes proposed by scientists and the general public. The BIPM's FAQ explains, for example, that the divergence is dependent on the amount of time elapsed between measurements and not dependent on the number of times the prototype or its copies have been cleaned or possible changes in gravity or environment. Reports published in 2013 by Peter Cumpson of Newcastle University based on the X-ray photoelectron spectroscopy of samples that were stored alongside various prototype kilograms suggested that one source of the divergence between the various prototypes could be traced to mercury that had been absorbed by the prototypes being in the proximity of mercury-based instruments. The IPK has been stored within centimetres of a mercury thermometer since at least as far back as the late 1980s. In this Newcastle University work six platinum weights made in the nineteenth century were all found to have mercury at the surface, the most contaminated of which had the equivalent of 250 μg of mercury when scaled to the surface area of a kilogram prototype. Scientists are seeing far greater variability in the prototypes than previously believed. The increasing divergence in the masses of the world's prototypes and the short-term instability in the IPK has prompted research into improved methods to obtain a smooth surface finish using diamond turning on newly manufactured replicas and was one of the reasons that led to the redefinition of the Kilogram. See § Redefinition agreed on 16 November 2018, below. The magnitude of many of the units comprising the SI system of measurement, including most of those used in the measurement of electricity and light, are highly dependent upon the stability of a 140-year-old, golf-ball-sized cylinder of metal stored in a vault in France. The stability of the IPK is crucial because the kilogram underpins much of the SI system of measurement as it is currently defined and structured. For instance, the newton is defined as the force necessary to accelerate one kilogram at one metre per second squared. If the mass of the IPK were to change slightly then the newton would also change proportionally. In turn, the pascal, the SI unit of pressure, is defined in terms of the newton. This chain of dependency follows to many other SI units of measure. For instance, the joule, the SI unit of energy, is defined as that expended when a force of one newton acts through one metre. Next to be affected is the SI unit of power, the watt, which is one joule per second. The ampere too is defined relative to the newton. With the magnitude of the primary units of electricity thus determined by the kilogram, so too follow many others, namely the coulomb, volt, tesla, and weber. Even units used in the measure of light would be affected; the candela—following the change in the watt—would in turn affect the lumen and lux. Because the magnitude of many of the units comprising the SI system of measurement is ultimately defined by the mass of a 140-year-old, golf-ball-sized piece of metal, the quality of the IPK must be diligently protected to preserve the integrity of the SI system. Yet, despite the best stewardship, the average mass of the worldwide ensemble of prototypes and the mass of the IPK have likely diverged another 7 μg since the third periodic verification 30 years ago. [Note 13] Further, the world's national metrology laboratories must wait for the fourth periodic verification to confirm whether the historical trends persisted. Fortunately, definitions of the SI units are quite different from their practical realizations. For instance, the metre is defined as the distance light travels in a vacuum during a time interval of ​1⁄299,792,458 of a second. 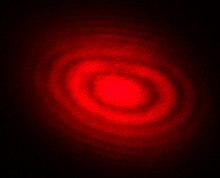 However, the metre's practical realization typically takes the form of a helium–neon laser, and the metre's length is delineated—not defined—as 7006157980029872800♠1579800.298728 wavelengths of light from this laser. Now suppose that the official measurement of the second was found to have drifted by a few parts per billion (it is actually extremely stable with a reproducibility of a few parts in 1015). There would be no automatic effect on the metre because the second—and thus the metre's length—is abstracted via the laser comprising the metre's practical realization. Scientists performing metre calibrations would simply continue to measure out the same number of laser wavelengths until an agreement was reached to do otherwise. The same is true with regard to the real-world dependency on the kilogram: if the mass of the IPK was found to have changed slightly, there would be no automatic effect upon the other units of measure because their practical realizations provide an insulating layer of abstraction. Any discrepancy would eventually have to be reconciled though, because the virtue of the SI system is its precise mathematical and logical harmony amongst its units. If the IPK's value were definitively proven to have changed, one solution would be to simply redefine the kilogram as being equal to the mass of the IPK plus an offset value, similarly to what is currently done with its replicas; e.g., "the kilogram is equal to the mass of the IPK + 42 parts per billion" (equivalent to 42 μg). The long-term solution to this problem, however, is to liberate the SI system's dependency on the IPK by developing a practical realization of the kilogram that can be reproduced in different laboratories by following a written specification. The units of measure in such a practical realization would have their magnitudes precisely defined and expressed in terms of fundamental physical constants. While major portions of the SI system would still be based on the kilogram, the kilogram would in turn be based on invariant, universal constants of nature. In the following subsections, wherever numeric equalities are shown in concise form—such as 7013185487000000000♠1.85487(14)×1013—the two digits between the parentheses denote the uncertainty at one standard deviation (1σ, the 68% confidence level) in the two least significant digits of the significand. The International Committee for Weights and Measures (CIPM) approved a proposed redefinition of SI base units in November 2018 that defines the kilogram by defining the Planck constant to be exactly 6966662607015000000♠6.62607015×10−34 kg⋅m2⋅s−1. This approach effectively defines the kilogram in terms of the second and the metre, and will take effect in 2019. Prior to the redefinition the kilogram, and several other SI units based on the kilogram, were defined by a man-made metal artefact: the Kilogram des Archives from 1799 to 1889, and the International Prototype Kilogram from 1889 onward. In 1960, the metre, previously similarly having been defined with reference to a single platinum-iridium bar with two marks on it, was redefined in terms of an invariant physical constant (the wavelength of a particular emission of light emitted by krypton, and later the speed of light) so that the standard can be independently reproduced in different laboratories by following a written specification. At the 94th Meeting of the International Committee for Weights and Measures (CIPM) in 2005, it was recommended that the same be done with the kilogram. In October 2010, the CIPM voted to submit a resolution for consideration at the General Conference on Weights and Measures (CGPM), to "take note of an intention" that the kilogram be defined in terms of the Planck constant, h (which has dimensions of energy times time) together with other physical constants. This resolution was accepted by the 24th conference of the CGPM in October 2011 and further discussed at the 25th conference in 2014. Although the Committee recognised that significant progress had been made, they concluded that the data did not yet appear sufficiently robust to adopt the revised definition, and that work should continue to enable the adoption at the 26th meeting, scheduled for 2018. Such a definition would theoretically permit any apparatus that was capable of delineating the kilogram in terms of the Planck constant to be used as long as it possessed sufficient precision, accuracy and stability. The Kibble balance (discussed below) is one way do this. As part of this project, a variety of very different technologies and approaches were considered and explored over many years. They too are covered below. Some of these now-abandoned approaches were based on equipment and procedures that would have enabled the reproducible production of new, kilogram-mass prototypes on demand (albeit with extraordinary effort) using measurement techniques and material properties that are ultimately based on, or traceable to, physical constants. Others were based on devices that measured either the acceleration or weight of hand-tuned kilogram test masses and which expressed their magnitudes in electrical terms via special components that permit traceability to physical constants. All approaches depend on converting a weight measurement to a mass, and therefore require the precise measurement of the strength of gravity in laboratories. All approaches would have precisely fixed one or more constants of nature at a defined value. The NIST's Kibble balance is a project of the US government to develop an "electronic kilogram". The vacuum chamber dome, which lowers over the entire apparatus, is visible at top. The Kibble balance (known as a "watt balance" before 2016) is essentially a single-pan weighing scale that measures the electric power necessary to oppose the weight of a kilogram test mass as it is pulled by Earth's gravity. It is a variation of an ampere balance, with an extra calibration step that eliminates the effect of geometry. The electric potential in the Kibble balance is delineated by a Josephson voltage standard, which allows voltage to be linked to an invariant constant of nature with extremely high precision and stability. Its circuit resistance is calibrated against a quantum Hall effect resistance standard. The Kibble balance requires extremely precise measurement of the local gravitational acceleration g in the laboratory, using a gravimeter. For instance when the elevation of the centre of the gravimeter differs from that of the nearby test mass in the Kibble balance, the NIST compensates for Earth's gravity gradient of 309 μGal per metre, which affects the weight of a one-kilogram test mass by about 316 μg/m. In April 2007, the NIST's implementation of the Kibble balance demonstrated a combined relative standard uncertainty (CRSU) of 36 μg. [Note 14] The UK's National Physical Laboratory's Kibble balance demonstrated a CRSU of 70.3 μg in 2007. That Kibble balance was disassembled and shipped in 2009 to Canada's Institute for National Measurement Standards (part of the National Research Council), where research and development with the device could continue. The local gravitational acceleration g is measured with exceptional precision with the help of a laser interferometer. The laser's pattern of interference fringes—the dark and light bands above—blooms at an ever-faster rate as a free-falling corner reflector drops inside an absolute gravimeter. The pattern's frequency sweep is timed by an atomic clock. Gravity and the nature of the Kibble balance, which oscillates test masses up and down against the local gravitational acceleration g, are exploited so that mechanical power is compared against electrical power, which is the square of voltage divided by electrical resistance. However, g varies significantly—by nearly 1%—depending on where on the Earth's surface the measurement is made (see Earth's gravity). There are also slight seasonal variations in g at a location due to changes in underground water tables, and larger semimonthly and diurnal changes due to tidal distortions in the Earth's shape caused by the Moon and the Sun. Although g would not be a term in the definition of the kilogram, it would be crucial in the process of measurement of the kilogram when relating energy to power. Accordingly, g must be measured with at least as much precision and accuracy as are the other terms, so measurements of g must also be traceable to fundamental constants of nature. For the most precise work in mass metrology, g is measured using dropping-mass absolute gravimeters that contain an iodine-stabilized helium–neon laser interferometer. The fringe-signal, frequency-sweep output from the interferometer is measured with a rubidium atomic clock. Since this type of dropping-mass gravimeter derives its accuracy and stability from the constancy of the speed of light as well as the innate properties of helium, neon, and rubidium atoms, the 'gravity' term in the delineation of an all-electronic kilogram is also measured in terms of invariants of nature—and with very high precision. For instance, in the basement of the NIST's Gaithersburg facility in 2009, when measuring the gravity acting upon Pt‑10Ir test masses (which are denser, smaller, and have a slightly lower center of gravity inside the Kibble balance than stainless steel masses), the measured value was typically within 8 ppb of 7000980101644000000♠9.80101644 m/s2. The virtue of electronic realizations like the Kibble balance is that the definition and dissemination of the kilogram would no longer be dependent upon the stability of kilogram prototypes, which must be very carefully handled and stored. It would free physicists from the need to rely on assumptions about the stability of those prototypes. Instead, hand-tuned, close-approximation mass standards would simply be weighed and documented as being equal to one kilogram plus an offset value. With the Kibble balance, while the kilogram would be delineated in electrical and gravity terms, all of which are traceable to invariants of nature; it would be defined in a manner that is directly traceable to three fundamental constants of nature. The Planck constant defines the kilogram in terms of the second and the metre. By fixing the Planck constant, the definition of the kilogram would in addition depend only on the definitions of the second and the metre. The definition of the second depends on a single defined physical constant: the ground state hyperfine splitting frequency of the caesium 133 atom Δν(133Cs)hfs. The metre depends on the second and on an additional defined physical constant: the speed of light c. Once the kilogram is redefined in this manner, physical objects such as the IPK will no longer be part of the definition, but will instead become transfer standards. Scales like the Kibble balance also permit more flexibility in choosing materials with especially desirable properties for mass standards. For instance, Pt‑10Ir could continue to be used so that the specific gravity of newly produced mass standards would be the same as existing national primary and check standards (≈21.55 g/ml). This would reduce the relative uncertainty when making mass comparisons in air. Alternatively, entirely different materials and constructions could be explored with the objective of producing mass standards with greater stability. For instance, osmium-iridium alloys could be investigated if platinum's propensity to absorb hydrogen (due to catalysis of VOCs and hydrocarbon-based cleaning solvents) and atmospheric mercury proved to be sources of instability. Also, vapor-deposited, protective ceramic coatings like nitrides could be investigated for their suitability for chemically isolating these new alloys. The challenge with Kibble balances is not only in reducing their uncertainty, but also in making them truly practical realizations of the kilogram. Nearly every aspect of Kibble balances and their support equipment requires such extraordinarily precise and accurate, state-of-the-art technology that—unlike a device like an atomic clock—few countries would currently choose to fund their operation. For instance, the NIST's Kibble balance used four resistance standards in 2007, each of which was rotated through the Kibble balance every two to six weeks after being calibrated in a different part of NIST headquarters facility in Gaithersburg, Maryland. It was found that simply moving the resistance standards down the hall to the Kibble balance after calibration altered their values 10 ppb (equivalent to 10 μg) or more. Present-day technology is insufficient to permit stable operation of Kibble balances between even biannual calibrations. When the new definition takes effect, it is likely there will only be a few—at most—Kibble balances initially operating in the world. Another Avogadro constant-based approach, known as the International Avogadro Coordination's Avogadro project, would define and delineate the kilogram as a 93.6 mm diameter sphere of silicon atoms. Silicon was chosen because a commercial infrastructure with mature processes for creating defect-free, ultra-pure monocrystalline silicon already exists to service the semiconductor industry. To make a practical realization of the kilogram, a silicon boule (a rod-like, single-crystal ingot) would be produced. Its isotopic composition would be measured with a mass spectrometer to determine its average relative atomic mass. The boule would be cut, ground, and polished into spheres. The size of a select sphere would be measured using optical interferometry to an uncertainty of about 0.3 nm on the radius—roughly a single atomic layer. The precise lattice spacing between the atoms in its crystal structure (≈ 192 pm) would be measured using a scanning X-ray interferometer. This permits its atomic spacing to be determined with an uncertainty of only three parts per billion. With the size of the sphere, its average atomic mass, and its atomic spacing known, the required sphere diameter can be calculated with sufficient precision and low uncertainty to enable it to be finish-polished to a target mass of one kilogram. Experiments are being performed on the Avogadro Project's silicon spheres to determine whether their masses are most stable when stored in a vacuum, a partial vacuum, or ambient pressure. However, no technical means currently exist to prove a long-term stability any better than that of the IPK's, because the most sensitive and accurate measurements of mass are made with dual-pan balances like the BIPM's FB‑2 flexure-strip balance (see § External links, below). Balances can only compare the mass of a silicon sphere to that of a reference mass. Given the latest understanding of the lack of long-term mass stability with the IPK and its replicas, there is no known, perfectly stable mass artefact to compare against. Single-pan scales, which measure weight relative to an invariant of nature, are not precise to the necessary long-term uncertainty of 10–20 parts per billion. Another issue to be overcome is that silicon oxidizes and forms a thin layer (equivalent to 5–20 silicon atoms deep) of silicon dioxide (quartz) and silicon monoxide. This layer slightly increases the mass of the sphere, an effect that must be accounted for when polishing the sphere to its finished size. Oxidation is not an issue with platinum and iridium, both of which are noble metals that are roughly as cathodic as oxygen and therefore don't oxidize unless coaxed to do so in the laboratory. The presence of the thin oxide layer on a silicon-sphere mass prototype places additional restrictions on the procedures that might be suitable to clean it to avoid changing the layer's thickness or oxide stoichiometry. All silicon-based approaches would fix the Avogadro constant but vary in the details of the definition of the kilogram. One approach would use silicon with all three of its natural isotopes present. About 7.78% of silicon comprises the two heavier isotopes: 29Si and 30Si. As described in § Carbon-12 below, this method would define the magnitude of the kilogram in terms of a certain number of 12C atoms by fixing the Avogadro constant; the silicon sphere would be the practical realization. This approach could accurately delineate the magnitude of the kilogram because the masses of the three silicon nuclides relative to 12C are known with great precision (relative uncertainties of 1 ppb or better). An alternative method for creating a silicon sphere-based kilogram proposes to use isotopic separation techniques to enrich the silicon until it is nearly pure 28Si, which has a relative atomic mass of 7001279769265325000♠27.9769265325(19). With this approach, the Avogadro constant would not only be fixed, but so too would the atomic mass of 28Si. As such, the definition of the kilogram would be decoupled from 12C and the kilogram would instead be defined as ​1000⁄7001279769265325000♠27.9769265325 ⋅ 7023602214179000000♠6.02214179×1023 atoms of 28Si (≈ 7001357437404300000♠35.74374043 fixed moles of 28Si atoms). Physicists could elect to define the kilogram in terms of 28Si even when kilogram prototypes are made of natural silicon (all three isotopes present). Even with a kilogram definition based on theoretically pure 28Si, a silicon-sphere prototype made of only nearly pure 28Si would necessarily deviate slightly from the defined number of moles of silicon to compensate for various chemical and isotopic impurities as well as the effect of surface oxides. Though not offering a practical realization, this definition would precisely define the magnitude of the kilogram in terms of a certain number of carbon‑12 atoms. Carbon‑12 (12C) is an isotope of carbon. The mole is currently defined as "the quantity of entities (elementary particles like atoms or molecules) equal to the number of atoms in 12 grams of carbon‑12". Thus, the current definition of the mole requires that ​1000⁄12 moles (​83 1⁄3 mol) of 12C has a mass of precisely one kilogram. The number of atoms in a mole, a quantity known as the Avogadro constant, is experimentally determined, and the current best estimate of its value is 7023602214085700000♠6.022140857(74)×1023 entities per mole. This new definition of the kilogram proposed to fix the Avogadro constant at precisely 7023602214000000000♠6.02214X×1023 mol−1 with the kilogram being defined as "the mass equal to that of ​1000⁄12 ⋅ 7023602214000000000♠6.02214X×1023 atoms of 12C". The accuracy of the measured value of the Avogadro constant is currently limited by the uncertainty in the value of the Planck constant. That relative standard uncertainty has been 50 parts per billion (ppb) since 2006. By fixing the Avogadro constant, the practical effect of this proposal would be that the uncertainty in the mass of a 12C atom—and the magnitude of the kilogram—could be no better than the current 50 ppb uncertainty in the Planck constant. Under this proposal, the magnitude of the kilogram would be subject to future refinement as improved measurements of the value of the Planck constant become available; electronic realizations of the kilogram would be recalibrated as required. Conversely, an electronic definition of the kilogram (see § Electronic approaches, below), which would precisely fix the Planck constant, would continue to allow ​83 1⁄3 moles of 12C to have a mass of precisely one kilogram but the number of atoms comprising a mole (the Avogadro constant) would continue to be subject to future refinement. Another Avogadro-based approach, ion accumulation, since abandoned, would have defined and delineated the kilogram by precisely creating new metal prototypes on demand. It would have done so by accumulating gold or bismuth ions (atoms stripped of an electron) and counting them by measuring the electric current required to neutralize the ions. Gold (197Au) and bismuth (209Bi) were chosen because they can be safely handled and have the two highest atomic masses among the mononuclidic elements that are stable (gold) or effectively so (bismuth). [Note 17] See also Table of nuclides. With a gold-based definition of the kilogram for instance, the relative atomic mass of gold could have been fixed as precisely 7002196966568700000♠196.9665687, from the current value of 7002196966568700000♠196.9665687(6). As with a definition based upon carbon‑12, the Avogadro constant would also have been fixed. The kilogram would then have been defined as "the mass equal to that of precisely ​1000⁄7002196966568700000♠196.9665687 ⋅ 7023602214179000000♠6.02214179×1023 atoms of gold" (precisely 3,057,443,620,887,933,963,384,315 atoms of gold or about 7000507700370999999♠5.07700371 fixed moles). In 2003, German experiments with gold at a current of only 7001100000000000000♠10 μA demonstrated a relative uncertainty of 1.5%. Follow-on experiments using bismuth ions and a current of 30 mA were expected to accumulate a mass of 30 g in six days and to have a relative uncertainty of better than 1 ppm. Ultimately, ion‑accumulation approaches proved to be unsuitable. Measurements required months and the data proved too erratic for the technique to be considered a viable future replacement to the IPK. Among the many technical challenges of the ion-deposition apparatus was obtaining a sufficiently high ion current (mass deposition rate) while simultaneously decelerating the ions so they could all deposit onto a target electrode embedded in a balance pan. Experiments with gold showed the ions had to be decelerated to very low energies to avoid sputtering effects—a phenomenon whereby ions that had already been counted ricochet off the target electrode or even dislodged atoms that had already been deposited. The deposited mass fraction in the 2003 German experiments only approached very close to 100% at ion energies of less than around 6981160217648700000♠1 eV (< 1 km/s for gold). If the kilogram had been defined as a precise quantity of gold or bismuth atoms deposited with an electric current, not only would the Avogadro constant and the atomic mass of gold or bismuth have to have been precisely fixed, but also the value of the elementary charge (e), likely to 6981160217000000000♠1.60217X×10−19 C (from the currently recommended value of 6981160217662079999♠1.6021766208(98)×10−19 C). Doing so would have effectively defined the ampere as a flow of ​1⁄6981160217000000000♠1.60217X×10−19 electrons per second past a fixed point in an electric circuit. The SI unit of mass would have been fully defined by having precisely fixed the values of the Avogadro constant and elementary charge, and by exploiting the fact that the atomic masses of bismuth and gold atoms are invariant, universal constants of nature. Beyond the slowness of making a new mass standard and the poor reproducibility, there were other intrinsic shortcomings to the ion‑accumulation approach that proved to be formidable obstacles to ion-accumulation-based techniques becoming a practical realization. The apparatus necessarily required that the deposition chamber have an integral balance system to enable the convenient calibration of a reasonable quantity of transfer standards relative to any single internal ion-deposited prototype. Furthermore, the mass prototypes produced by ion deposition techniques would have been nothing like the freestanding platinum-iridium prototypes currently in use; they would have been deposited onto—and become part of—an electrode imbedded into one pan of a special balance integrated into the device. Moreover, the ion-deposited mass wouldn't have had a hard, highly polished surface that can be vigorously cleaned like those of current prototypes. Gold, while dense and a noble metal (resistant to oxidation and the formation of other compounds), is extremely soft so an internal gold prototype would have to be kept well isolated and scrupulously clean to avoid contamination and the potential of wear from having to remove the contamination. Bismuth, which is an inexpensive metal used in low-temperature solders, slowly oxidizes when exposed to room-temperature air and forms other chemical compounds and so would not have produced stable reference masses unless it was continually maintained in a vacuum or inert atmosphere. 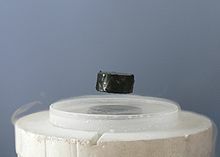 A magnet floating above a superconductor bathed in liquid nitrogen demonstrates perfect diamagnetic levitation via the Meissner effect. Experiments with an ampere-based definition of the kilogram flipped this arrangement upside-down: an electric field accelerated a superconducting test mass supported by fixed magnets. This approach would define the kilogram as "the mass which would be accelerated at precisely 6993200000000000000♠2×10−7 m/s2 when subjected to the per-metre force between two straight parallel conductors of infinite length, of negligible circular cross section, placed one metre apart in vacuum, through which flow a constant current of ​1⁄1.60217X×10^−19 elementary charges per second". Effectively, this would define the kilogram as a derivative of the ampere rather than the present relationship, which defines the ampere as a derivative of the kilogram. This redefinition of the kilogram would specify elementary charge (e) as precisely 1.60217X×10^−19 coulomb rather than the current recommended value of 6981160217662079999♠1.6021766208(98)×10−19 C. It would necessarily follow that the ampere (one coulomb per second) would also become an electric current of this precise quantity of elementary charges per second passing a given point in an electric circuit. The virtue of a practical realization based upon this definition is that unlike the Kibble balance and other scale-based methods, all of which require the careful characterization of gravity in the laboratory, this method delineates the magnitude of the kilogram directly in the very terms that define the nature of mass: acceleration due to an applied force. Unfortunately, it is extremely difficult to develop a practical realization based upon accelerating masses. Experiments over a period of years in Japan with a superconducting, 30 g mass supported by diamagnetic levitation never achieved an uncertainty better than ten parts per million. Magnetic hysteresis was one of the limiting issues. Other groups performed similar research that used different techniques to levitate the mass. Because SI prefixes may not be concatenated (serially linked) within the name or symbol for a unit of measure, SI prefixes are used with the unit gram, not kilogram, which already has a prefix as part of its name. For instance, one-millionth of a kilogram is 1 mg (one milligram), not 1 μkg (one microkilogram). In the United Kingdom, because serious medication errors have been made from the confusion between milligrams and micrograms when micrograms has been abbreviated, the recommendation given in the Scottish Palliative Care Guidelines is that doses of less than one milligram must be expressed in micrograms and that the word microgram must be written in full, and that it is never acceptable to use "mcg" or "μg". The hectogram is a very commonly used unit in the retail food trade in Italy, usually called an etto, short for ettogrammo, the Italian for hectogram. The former standard spelling and abbreviation "deka-" and "dk" produced abbreviations such as "dkm" (dekametre) and "dkg" (dekagram). The abbreviation "dkg" is still used in parts of central Europe in retail for some foods such as cheese and meat. The unit name megagram is rarely used, and even then typically only in technical fields in contexts where especially rigorous consistency with the SI standard is desired. For most purposes, the name tonne is instead used. The tonne and its symbol, "t", were adopted by the CIPM in 1879. It is a non-SI unit accepted by the BIPM for use with the SI. According to the BIPM, "In English speaking countries this unit is usually called 'metric ton'." The unit name megatonne or megaton (Mt) is often used in general-interest literature on greenhouse gas emissions, whereas the equivalent unit in scientific papers on the subject is often the teragram (Tg). ^ The avoirdupois pound is part of both United States customary system of units and the Imperial system of units. It is defined as exactly 6999453592370000000♠0.45359237 kilograms. ^ The spelling kilogram is the modern spelling used by the International Bureau of Weights and Measures (BIPM), the US National Institute of Standards and Technology (NIST), the UK's National Measurement Office, National Research Council of Canada, and the National Measurement Institute, Australia. ^ The French text (which is the authoritative text) states "Il n'est pas autorisé d'utiliser des abréviations pour les symboles et noms d'unités ..."
^ The same decree also defined the litre as follows: "Liter: the measure of volume, both for liquid and solids, for which the displacement would be that of a cube [with sides measuring] one-tenth of a metre." Original text: "Litre, la mesure de capacité, tant pour les liquides que pour les matières sèches, dont la contenance sera celle du cube de la dixièrne partie du mètre." ^ Modern measurements show the temperature at which water reaches maximum density is 3.984 °C. However, the scientists at the close of the 18th century concluded that the temperature was 4 °C. 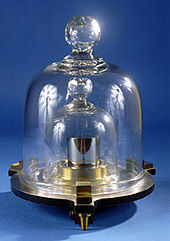 ^ The provisional kilogram standard had been fabricated in accordance with a single, inaccurate measurement of the density of water made earlier by Antoine Lavoisier and René Just Haüy, which showed that one cubic decimetre of distilled water at 0 °C had a mass of 18,841 grains in France's soon-to-be-obsoleted poids de marc system. The newer, highly accurate measurements by Lefèvre‑Gineau and Fabbroni concluded that the mass of a cubic decimetre of water at the new temperature of 4 °C—a condition at which water is denser—was actually less massive, at 18,827.15 grains, than the earlier inaccurate value assumed for 0 °C water. France's metric system had been championed by Charles Maurice de Talleyrand‑Périgord. On March 30, 1791, four days after Talleyrand forwarded a specific proposal on how to proceed with the project, the French government ordered a committee known as the Academy to commence work on accurately determining the magnitude of the base units of the new metric system. The Academy divided the task among five commissions. The commission charged with determining the mass of a cubic decimetre of water originally comprised Lavoisier and Haüy but their work was finished by Louis Lefèvre‑Gineau and Giovanni Fabbroni. Neither Lavoisier nor Haüy can be blamed for participating in an initial—and inaccurate—measurement and for leaving the final work to Lefèvre‑Gineau and Fabbroni to finish in 1799. As a member of the Ferme générale, Lavoisier was also one of France's 28 tax collectors. He was consequently convicted of treason during the waning days of the Reign of Terror period of the French Revolution and beheaded on May 8, 1794. Lavoisier's partner, Haüy, was also thrown into prison and was himself at risk of going to the guillotine but his life was spared after a renowned French naturalist interceded. ^ The Pavillon's (and hence the BIPM's) postal address is in the neighboring commune of Sèvres, so it is often reported as being located there, but the grounds are on the commune of Saint-Cloud (OpenStreetMap). ^ a b Prototype No. 8(41) was accidentally stamped with the number 41, but its accessories carry the proper number 8. Since there is no prototype marked 8, this prototype is referred to as 8(41). ^ Nos. 42′, 77 and 650 are called "standards" rather than "prototypes" because they are slightly underweight, slightly too much material having been removed when they were manufactured. Other than being more than 1 mg below the nominal 1 kg mass, they are identical to the prototypes, and are used during routine calibration work. ^ The other two Pt‑10Ir standards owned by the US are K79, from a new series of prototypes (K64–K80) that were diamond-turned directly to a finish mass, and K85, which is used for Kibble balance experiments (see § Kibble balance, above). ^ Note that if the 50 μg difference between the IPK and its replicas was entirely due to wear, the IPK would have to have lost 150 million billion more platinum and iridium atoms over the last century than its replicas. That there would be this much wear, much less a difference of this magnitude, is thought unlikely; 50 μg is roughly the mass of a fingerprint. Specialists at the BIPM in 1946 carefully conducted cleaning experiments and concluded that even vigorous rubbing with a chamois—if done carefully—did not alter the prototypes' mass. More recent cleaning experiments at the BIPM, which were conducted on one particular prototype (K63), and which benefited from the then-new NBS‑2 balance, demonstrated 2 μg stability. Experiments on prototypes No. 7 and 32 in January 2014 showed less than 0.5 μg mass lost from a third complete cleaning and washing cycle. Many theories have been advanced to explain the divergence in the masses of the prototypes. One theory posits that the relative change in mass between the IPK and its replicas is not one of loss at all and is instead a simple matter that the IPK has gained less than the replicas. This theory begins with the observation that the IPK is uniquely stored under three nested bell jars whereas its six sister copies stored alongside it in the vault as well as the other replicas dispersed throughout the world are stored under only two. This theory is also founded on two other facts: that platinum has a strong affinity for mercury, and that atmospheric mercury is significantly more abundant in the atmosphere today than at the time the IPK and its replicas were manufactured. The burning of coal is a major contributor to atmospheric mercury and both Denmark and Germany have high coal shares in electrical generation. Conversely, electrical generation in France, where the IPK is stored, is mostly nuclear. This theory is supported by the fact that the mass divergence rate—relative to the IPK—of Denmark's prototype, K48, since it took possession in 1949 is an especially high 78 μg per century while that of Germany's prototype has been even greater at 126 μg/century ever since it took possession of K55 in 1954. However, still other data for other replicas isn't supportive of this theory. This mercury absorption theory is just one of many advanced by the specialists to account for the relative change in mass. To date, each theory has either proven implausible, or there are insufficient data or technical means to either prove or disprove it. ^ The mean change in mass of the first batch of replicas relative to the IPK over one hundred years is +23.5 μg with a standard deviation of 30 μg. Per The Third Periodic Verification of National Prototypes of the Kilogram (1988–1992), G. Girard, Metrologia 31 (1994) Pg. 323, Table 3. Data is for prototypes K1, K5, K6, K7, K8(41), K12, K16, K18, K20, K21, K24, K32, K34, K35, K36, K37, K38, and K40; and excludes K2, K23, and K39, which are treated as outliers. This is a larger data set than is shown in the chart at the top of this section, which corresponds to Figure 7 of G. Girard's paper. ^ Assuming the past trend continues, whereby the mean change in mass of the first batch of replicas relative to the IPK over one hundred years was +23.5 σ30 μg. ^ The combined relative standard uncertainty (CRSU) of these measurements, as with all other tolerances and uncertainties in this article unless otherwise noted, are at one standard deviation (1σ), which equates to a confidence level of about 68%; that is to say, 68% of the measurements fall within the stated tolerance. ^ The sphere shown in the photograph has an out-of-roundness value (peak to valley on the radius) of 50 nm. According to ACPO, they improved on that with an out-of-roundness of 35 nm. On the 93.6 mm diameter sphere, an out-of-roundness of 35 nm (deviation of ±17.5 nm from the average) is a fractional roundness (∆r/r) = 6993370000000000000♠3.7×10−7. Scaled to the size of Earth, this is equivalent to a maximum deviation from sea level of only 2.4 m. The roundness of that ACPO sphere is exceeded only by two of the four fused-quartz gyroscope rotors flown on Gravity Probe B, which were manufactured in the late 1990s and given their final figure at the W.W. Hansen Experimental Physics Lab at Stanford University. Particularly, "Gyro 4" is recorded in the Guinness database of world records (their database, not in their book) as the world's roundest man-made object. According to a published report (221 kB PDF, here Archived February 27, 2008, at the Wayback Machine) and the GP‑B public affairs coordinator at Stanford University, of the four gyroscopes onboard the probe, Gyro 4 has a maximum surface undulation from a perfect sphere of 3.4 ±0.4 nm on the 38.1 mm diameter sphere, which is a ∆r/r = 6993180000000000000♠1.8×10−7. Scaled to the size of Earth, this is equivalent to an deviation the size of North America rising slowly up out of the sea (in molecular-layer terraces 11.9 cm high), reaching a maximum elevation of 1.14 ±0.13 m in Nebraska, and then gradually sloping back down to sea level on the other side of the continent. ^ The proposal originally was to redefine the kilogram as the mass of 7007844468860000000♠844468863 carbon-12 atoms. The value 7007844468860000000♠84446886 had been chosen because it has a special property; its cube (the proposed new value for the Avogadro constant) is divisible by twelve. Thus with that definition of the kilogram, there would have been an integer number of atoms in one gram of 12C: 7022501845081902290♠50184508190229061679538 atoms. The uncertainty in the Avogadro constant has narrowed considerably since this proposal was first submitted to American Scientist for publication. The 2014 CODATA value for the Avogadro constant (7023602214085700000♠6.022140857(74)×1023) has a relative standard uncertainty of 12 parts per billion and the cube root of this number is 7007844468854100000♠84446885.41(35), i.e. there are no integers within the range of uncertainty. ^ In 2003, the same year the first gold-deposition experiments were conducted, physicists found that the only naturally occurring isotope of bismuth, 209Bi, is actually very slightly radioactive, with the longest known radioactive half-life of any naturally occurring element that decays via alpha radiation—a half-life of 7026599594400000000♠(19±2)×1018 years. As this is 1.4 billion times the age of the universe, 209Bi is considered a stable isotope for most practical applications (those unrelated to such disciplines as nucleocosmochronology and geochronology). In other terms, 6999999999999830000♠99.999999983% of the bismuth that existed on Earth 4.567 billion years ago still exists today. Only two mononuclidic elements are heavier than bismuth and only one approaches its stability: thorium. Long considered a possible replacement for uranium in nuclear reactors, thorium can cause cancer when inhaled because it is over 1.2 billion times more radioactive than bismuth. It also has such a strong tendency to oxidize that its powders are pyrophoric. These characteristics make thorium unsuitable in ion-deposition experiments. See also Isotopes of bismuth, Isotopes of gold and Isotopes of thorium. ^ Criterion: A combined total of at least five occurrences on the British National Corpus and the Corpus of Contemporary American English, including both the singular and the plural for both the -gram and the -gramme spelling. ^ The practice of using the abbreviation "mcg" rather than the SI symbol "μg" was formally mandated in the US for medical practitioners in 2004 by the Joint Commission on Accreditation of Healthcare Organizations (JCAHO) in their "Do Not Use" List: Abbreviations, Acronyms, and Symbols because "μg" and "mg" when handwritten can be confused with one another, resulting in a thousand-fold overdosing (or underdosing). The mandate was also adopted by the Institute for Safe Medication Practices. ^ "International Recommendation R 52 – Hexagonal weights – Metrological and technical requirements" (PDF). International Organization of Legal Metrology. 2004. Retrieved December 28, 2012. ^ Gramme, le poids absolu d'un volume d'eau pure égal au cube de la centième partie du mètre, et à la température de la glace fondante; The term poids absolu was at the time used alongside masse for the concept of "mass" (which latter term had first been introduced in its strict physical sense in English in 1704). See e.g. Mathurin Jacques Brisson, Dictionnaire raisonné de toutes les parties de la Physique, Volland, 1787, p. 401. ^ Proceedings of the 106th meeting (PDF). International Committee for Weights and Measures. Sèvres. 20 October 2017. ^ Milton, Martin (14 November 2016). Highlights in the work of the BIPM in 2016 (PDF). SIM XXII General Assembly. Montevideo, Uruguay. p. 10. ^ Wood, B. (3–4 November 2014). "Report on the Meeting of the CODATA Task Group on Fundamental Constants" (PDF). BIPM. p. 7. [BIPM director Martin] Milton responded to a question about what would happen if ... the CIPM or the CGPM voted not to move forward with the redefinition of the SI. He responded that he felt that by that time the decision to move forward should be seen as a foregone conclusion. ^ Decision CIPM/105-13 (October 2016). The day is the 144th anniversary of the Metre Convention. ^ "Appendix 8 – Customary System of Weights and Measures" (PDF). National Bureau of Standards (predecessor of the NIST). Archived from the original (1.6 MB PDF) on January 18, 2009. "Frequently Asked Questions". National Research Council Canada. Archived from the original on September 4, 2011. "Converting Measurements to Metric—NIST FAQs". NIST. "Metric Conversions". UK National Measurement Office. "Fed-Std-376B, Preferred Metric Units for General Use By the Federal Government" (PDF). NIST. Archived from the original (294 KB PDF) on August 16, 2010. ^ a b "Kilogram". Oxford English Dictionary. Oxford University Press. Retrieved November 3, 2011. ^ Fowlers, HW; Fowler, FG (1964). The Concise Oxford Dictionary. Oxford: The Clarendon Press. Greek γράμμα (as it were γράφ-μα, Doric γράθμα) means "something written, a letter", but it came to be used as a unit of weight, apparently equal to 1/24 of an ounce (1/288 of a libra, which would correspond to about 1.14 grams in modern units), at some time during Late Antiquity. French gramme was adopted from Latin gramma, itself quite obscure, but found in the Carmen de ponderibus et mensuris (8.25) attributed by Remmius Palaemon (fl. 1st century), where it is the weight of two oboli (Charlton T. Lewis, Charles Short, A Latin Dictionary s.v. "gramma", 1879). Henry George Liddell. Robert Scott. A Greek-English Lexicon (revised and augmented edition, Oxford, 1940) s.v. γράμμα, citing the 10th-century work Geoponica and a 4th-century papyrus edited in L. Mitteis, Griechische Urkunden der Papyrussammlung zu Leipzig, vol. i (1906), 62 ii 27. ^ "Décret relatif aux poids et aux mesures du 18 germinal an 3 (7 avril 1795)" [Decree of 18 Germinal, year III (April 7, 1795) regarding weights and measures]. Grandes lois de la République (in French). Digithèque de matériaux juridiques et politiques, Université de Perpignan. Retrieved November 3, 2011. ^ Convention nationale, décret du 1er août 1793, ed. Duvergier, Collection complète des lois, décrets, ordonnances, règlemens avis du Conseil d'état, publiée sur les éditions officielles du Louvre, vol. 6 (2nd ed. 1834), p. 70. The metre (mètre) on which this definition depends was itself defined as the ten-millionth part of a quarter of Earth's meridian, given in traditional units as 3 pieds, 11.44 lignes (a ligne being the 12th part of a pouce (inch), or the 144th part of a pied. ^ "Kilogram". Oxford Dictionaries. Archived from the original on May 10, 2013. Retrieved November 3, 2011. ^ "Spelling of "gram", etc". Weights and Measures Act 1985. Her Majesty's Stationery Office. October 30, 1985. Retrieved November 6, 2011. ^ "kilo (n1)". Oxford English Dictionary (2nd ed.). Oxford: Oxford University Press. 1989. Retrieved November 8, 2011. ^ "kilo (n2)". Oxford English Dictionary (2nd ed.). Oxford: Oxford University Press. 1989. Retrieved November 8, 2011. ^ "Style Guide" (PDF). The Economist. January 7, 2002. Retrieved November 8, 2011. ^ "kilogram, kg, kilo". Termium Plus. Government of Canada. Archived from the original on May 10, 2013. Retrieved November 6, 2011. ^ "kilo". How Many?. Retrieved November 6, 2011. ^ 29th Congress of the United States, Session 1 (May 13, 1866). "H.R. 596, An Act to authorize the use of the metric system of weights and measures". Archived from the original on July 5, 2015. ^ Resolution 6 – Proposal for establishing a practical system of units of measurement. 9th Conférence Générale des Poids et Mesures (CGPM). October 12–21, 1948. Retrieved May 8, 2011. ^ a b "Decree on weights and measures". April 7, 1795. Gramme, le poids absolu d'un volume d'eau pure égal au cube de la centième partie du mètre, et à la température de la glace fondante. ^ "L'histoire du mètre, la détermination de l'unité de poids". ^ Zupko, Ronald Edward (1990). Revolution in Measurement: Western European Weights and Measures Since the Age of Science. DIANE Publishing. ^ "Resolution of the 1st CGPM (1889)". BIPM. ^ a b Quinn, T. J. (1986). "New Techniques in the Manufacture of Platinum-Iridium Mass Standards". Platinum Metals Review. 30 (2): 74–79. ^ Terry Quinn. From Artefacts to Atoms: The BIPM and the Search for Ultimate Measurement Standards. Oxford University Press. p. 321. ^ a b Stock, Michael; Barat, Pauline; Davis, Richard S.; Picard, Alain; Milton, Martin J. T. (24 March 2015). "Calibration campaign against the international prototype of the kilogram in anticipation of the redefinition of the kilogram part I: comparison of the international prototype with its official copies". Metrologia. 52 (2): 310–316. Bibcode:2015Metro..52..310S. doi:10.1088/0026-1394/52/2/310. ^ a b c d G. Girard (1994). "The Third Periodic Verification of National Prototypes of the Kilogram (1988–1992)". Metrologia. 31 (4): 317–336. Bibcode:1994Metro..31..317G. doi:10.1088/0026-1394/31/4/007. ^ Picard, A. (February 2012). "Director's Report on the Activity and Management of the International Bureau of Weights and Measures; Supplement: scientific Departments" (PDF). Bureau International des Poids et Mesures. Archived from the original (PDF) on December 31, 2013. Retrieved August 3, 2013. ^ Килограмм [Kilogram] (in Russian), retrieved December 28, 2013, Из 40 изготовленных копий прототипа две (№12 и №26) были переданы России. Эталон №12 принят в СССР в качестве государственного первичного эталона единицы массы, а №26 — в качестве эталона-копии. ^ Gutfelt, Bengt; Johansson, Mathias; Nyfeldt, Per; Pendrill, Leslie (2014). 13th Comparison between the Swedish national kilogram and SP principal standards for one kilogram (PDF). Borås: SP Technical Research Institute of Sweden. p. 3. ISBN 978-91-87461-72-9. Retrieved 12 May 2017. ^ Z. J. Jabbour; S. L. Yaniv (2001). "The Kilogram and Measurements of Mass and Force" (PDF). Journal of Research of the National Institute of Standards and Technology. 106 (1): 25–46. doi:10.6028/jres.106.003. PMC 4865288. PMID 27500016. Retrieved August 4, 2013. ^ Z.J. Jabbour; S.L. Yaniv (Jan–Feb 2001). "The Kilogram and Measurements of Mass and Force" (PDF). Journal of Research of the National Institute of Standards and Technology. 106 (1): 25–46. doi:10.6028/jres.106.003. PMC 4865288. PMID 27500016. ^ a b Mills, Ian M.; Mohr, Peter J; Quinn, Terry J; Taylor, Barry N; Williams, Edwin R (April 2005). "Redefinition of the kilogram: a decision whose time has come" (PDF). Metrologia. 42 (2): 71–80. Bibcode:2005Metro..42...71M. doi:10.1088/0026-1394/42/2/001. Archived from the original (PDF) on November 20, 2011. Retrieved November 25, 2009. ^ Davis, Richard (December 2003). "The SI unit of mass" (PDF). Metrologia. 40 (6): 299–305. Bibcode:2003Metro..40..299D. doi:10.1088/0026-1394/40/6/001. Retrieved November 25, 2009. ^ R. S. Davis (July–August 1985). "Recalibration of the U.S. National Prototype Kilogram" (PDF). Journal of Research of the National Bureau of Standards. 90 (4): 263-281. ^ a b Conjecture why the IPK drifts, R. Steiner, NIST, Sep 11, 2007. ^ "FAQs". BIPM. Retrieved April 3, 2011. ^ Cumpson, Peter (October 2013). "Stability of reference masses: VI. Mercury and carbonaceous contamination on platinum weights manufactured at a similar time as the international and national prototype kilograms". Metrologia. 50 (5): 518–531. Bibcode:2013Metro..50..518D. doi:10.1088/0026-1394/50/5/518. Retrieved November 30, 2013. ^ "Time". Scientific work of the BIPM. BIPM. Retrieved May 7, 2011. ^ Pallab Ghosh (16 November 2018). "Kilogram gets a new definition". BBC News. Retrieved 16 November 2018. ^ Recommendation 1: Preparative steps towards new definitions of the kilogram, the ampere, the kelvin and the mole in terms of fundamental constants (PDF). 94th meeting of the International Committee for Weights and Measures. October 2005. p. 233. Archived (PDF) from the original on June 30, 2007. Retrieved February 7, 2018. ^ "NIST Backs Proposal for a Revamped System of Measurement Units". Nist.gov. Retrieved April 3, 2011. ^ Ian Mills (September 29, 2010). "Draft Chapter 2 for SI Brochure, following redefinitions of the base units" (PDF). CCU. Retrieved January 1, 2011. ^ Resolution 1 – On the possible future revision of the International System of Units, the SI (PDF). 24th meeting of the General Conference on Weights and Measures. Sèvres, France. October 17–21, 2011. Retrieved October 25, 2011. ^ a b "BIPM - Resolution 1 of the 25th CGPM". www.bipm.org. Retrieved 2017-03-27. ^ "General Conference on Weights and Measures approves possible changes to the International System of Units, including redefinition of the kilogram" (PDF) (Press release). Sèvres, France: General Conference on Weights and Measures. October 23, 2011. Retrieved October 25, 2011. ^ Steiner, Richard L.; Williams, Edwin R.; Liu, Ruimin; Newell, David B. (2007). "Uncertainty Improvements of the NIST Electronic Kilogram". IEEE Transactions on Instrumentation and Measurement. 56 (2): 592–596. doi:10.1109/TIM.2007.890590. ISSN 0018-9456. ^ R. Steiner, Watts in the watt balance, NIST, Oct 16, 2009. ^ R. Steiner, No FG-5?, NIST, Nov 30, 2007. "We rotate between about 4 resistance standards, transferring from the calibration lab to my lab every 2–6 weeks. Resistors do not transfer well, and sometimes shift at each transfer by 10 ppb or more." ^ Lim, XiaoZhi (16 November 2018). "The Kilogram Is Dead. Long Live the Kilogram!". The New York Times. Avogadro’s constant and the Planck constant are intertwined in the laws of physics. Having measured Avogadro’s constant, Dr. Bettin could derive the Planck constant. And with a precise measure of the Planck constant, he could validate the results of Dr. Kibble’s work, and vice versa. ^ Brumfiel, Geoff (October 21, 2010). "Elemental shift for kilo" (PDF). Nature. 467 (7318): 892. doi:10.1038/467892a. PMID 20962811. ^ Hill, Theodore P; Miller, Jack; Censullo, Albert C (June 1, 2011). "Towards a better definition of the kilogram". Metrologia. 48 (3): 83–86. arXiv:1005.5139. Bibcode:2011Metro..48...83H. doi:10.1088/0026-1394/48/3/002. ^ Georgia Tech, "A Better Definition for the Kilogram?" September 21, 2007 (press release). ^ General Conference on Weights and Measures, 22nd Meeting, October 2003 (3.2 MB ZIP file). ^ Bowers, Mary, The Caravan, September 1–15, 2009: "Why the World is Losing Weight"
^ "Beyond the kilogram: redefining the International System of Units" (Press release). NIST. Archived from the original on May 22, 2008. ^ Robinson, I.A. (April 2009). "Toward a Final Result From the NPL Mark II Watt Balance". IEEE Transactions on Instrumentation and Measurement. 58 (4): 936–941. doi:10.1109/TIM.2008.2008090. ^ Giacomo Devoto, Gian Carlo Oli, Nuovo vocabolario illustrato della lingua italiana, 1987, s.v. 'ètto': "frequentissima nell'uso comune: un e. di caffè, un e. di mortadella; formaggio a 2000 lire l'etto"
Wikimedia Commons has media related to Kilogram. NPL: What are the differences between mass, weight, force and load? Sample, Ian (November 9, 2018). "In the balance: scientists vote on first change to kilogram in a century". The Guardian. Retrieved November 9, 2018. "The role of the Planck constant in physics" - presentation at 26th CGPM meeting at Versailles, France, November 2018 when voting on superseding the IPK took place.